A tweetup is where people who find they are talking to each other, or to shared/overlapping contacts, on twitter meet up in the real world… because they can. That’s it – you live near enough each other to go down the pub and find out what all these people actually look like. constructive – [optional] discover things that you care about, share views about, want to make better – and find out if there’s anything you can do, or want to do, together. Twitter is pretty diverse. It would be surprising if everyone who turned up agreed with, or liked, everyone else. So it’s a chance to exercise your tolerance and open-mindedness muscles too. Me? 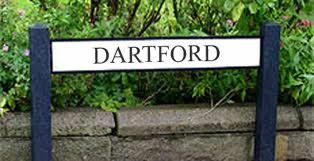 I like Dartford, I think it could be even better, I like meeting new people, I’m hard to offend or embarrass and I quite like an excuse to drink beer. Let me know if you can make it. Or just make [really positive constructive] comments via the quite obscure ‘leave a Comment’ link below. Keep an eye, or a search, out for the #dartfordtweetup tag on twitter. There’s also a public list on twitter . It’s built on a friend-of-a-friend basis – so let me know if you want to be added or taken off. Once we actually meet, I can more easily get your ideas on future tweetups, location, format, topics [if any], people, day of the week, frequency… anything and everything.